Looking forward to seeing your latest version. Keep up the good work, it is tough but you are hanging in there! hi, i’ve downloaded the plugin and would like to try and put it on the sidebar. how do i do that? You cannot put it in the sidebar in the current version of the plugin. And can we add it in a static page? If so how the code should be? I used the code of [SURVEYS 1] in the html format. However, it didn’t show the survey form. also, i tried to add questions to the survey, i was told it was added. however, it didn’t show anything under questions. Try deactivating and re-activating the plugin. The error is caused because the plugin was unable to create the database table automatically. Could be a permission issue for the database user. I have created a new version of the plugin – I think the problem is fixed now. Please update the plugin on your site – and let me know how it goes. I get the same error on 2.7.1 as well, I’ve deactivated and re-activated the plug in. Its not a permissions issue, the database user has all privileges. I really like this plugin and would like to use it, but need to resolve these errors. I have created a new version of the plugin – I think the problem is fixed now. Please update the plugin on your site – and let me know how it went. Where can I download the new version, all the links point to the wordpress.org site which is the version from yesterday. Nothing I can do about it – the wordpress system will automatically switch the version, I think. Wondered if there’s a simple way to increase the width of the input text boxes? Brilliant work – much appreciated. Binny, I have the same question as Dubber. And would like to enlarge the width and height of the free text response box. You’ll have to edit the code for that – Open show_survey.php in the surveys folder and change the lines 130-135 according to your needs. I tried to install you survey, but get a 404 error when I create a new survey. I suspect it has something to do with moving my site’s URL location to the root directory (sorry-I am sketchy on the details of what I did or how I did it (it’s been a while)–i just set it so the URL appears to come from my root domain instead of my install folder). I’m excited about this plugin. Any ideas? 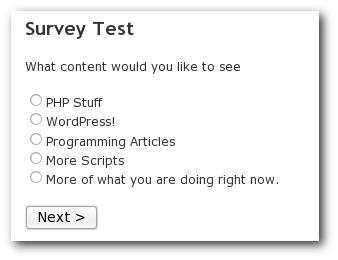 I started experimenting with your Surveys plugin in WP 2.7 and ran into problems when assigning questions. Turns out the problem was your use of short php tags in a couple of places in the question.php file. If you do a search for those short php tags and replace them (don’t remember if there were two or three), it so far seems to work in 2.7. How can I limit the number of times one PC can vote? via cookie or IP. It’s really important, otherwise the system is easily gamed. Unfortunately, that cannot be done in the current version. Its a planned feature for the next version. I was wondering if you could help me figure out what the following error means? Is there anyway to share one survey on many diferent posts but having responses with the ID of the post? If I want to display the survey someplace other than in a post, maybe the default.php file. Is there a PHP command I can use to call the function? and the survey will appear. I attempted the plug-in on my site but was un-luckily did not suceed fully.I will require your help in achieving success.I followed procedure as given but did not succeed?Is the survey ok with word-press version 2.8. I uploaded content to /wp-content/plugins/folder activated the plug-in and then went to settings and clicked on surveys setting which resulted in to following error message. pls respond.Thanks. can restrict the survey to users who has login to your web? another question: can you add following data to record, for the users, the answers he has selected? how to modify this pluign to support other language asia language? this pluign is coding by utf8? Hi, I installed it, activated it, got an error, deactivated it, reactivated it (no error) but I can’t see “Manage > Surveys” anywhere? I’m using 2.8 and I’m new to WordPress. Am I missing something? Thanks! Try Tools > Surveys in the admin side. Excellent, thank you – that worked a treat! I am unable to add a new survey. I get a message You do not have sufficient permissions to access this page. However, I am the administrator. How can I export the results into a csv file? Hi Binny, I’m getting the same error as Tom above – “You do not have sufficient permissions to access this page.” This happens once I click on the “Create New Survey” link on the “Manage Survey” page. I trying this on a local installation of WordPress on Windows & Apache. Great plugin but how to export as a CSV please ? Does anyone know why I cannot see any surveys I create when I return to Manage Surveys? It tells me there are no surveys found and just gives me the option to create a new one. I have the same problem. I create surveys. Then I got back to manage them and they do not show. If you find/fix, please email me and let me know. I’m using 2.8 and I’m new to WordPress. I’m getting the same error as Tom above and Nithin – “You do not have sufficient permissions to access this page.” This happens once I click on the “Create New Survey” link on the “Manage Survey” page. I trying this on a local installation of WordPress on Windows & Apache. I gives all permissions for my admin user on the database… I don’t really understand .. I resolve my first problem : the database was not created when a activate the plugin. I try to delete a reactivate plugin with the wordpress plugin administration and the database was not created. I decide to download the plugin then install it! and it works, the surveys database is created!!!!!! And i also have a page with “You do not have sufficient permissions to access this page.” However, I am the administrator and have all the permission in the database. I really don’t understand the problem ?? It seems to make a request upadte data in wp_surveys_result_answer table whereas i could not open plugin page to edit any survey!! The plugin has some compatibility issues with WP 2.8 – But I’m too busy to fix it right now. I’ll work on it as soon as I get some time. I didn’t actually solve the problem on my local machine, but went ahead and deployed the survey on our actual site(running WP 2.8.4) and it worked just fine (http://tidycity.org/blog/survey). Indicates some problem with my local windows/wp installation. Suspect same in your case. 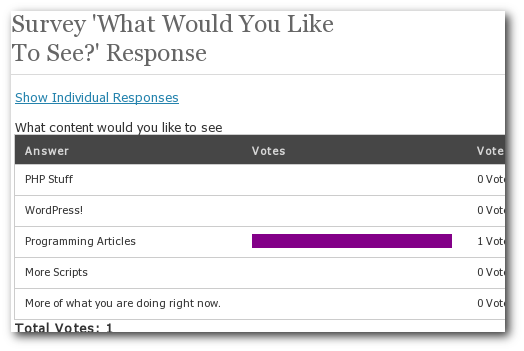 Using WP 2.8 I can create surveys and embed them. When I go back to manage surveys there are no surveys showing. Any idea what the issue could be? Seems like at least one other person has the same issue. How can I translate the survey plugin ? Where I have to put the .mo file ? And what name should I use for that .mo file ??? I see the export to csv question came up a couple of times, any plans to address this in the future? FYI: I copied all the results and pasted them into an excel file. Excel was able to assign the data to all the individual cells pretty nicely, but I’m no excel expert. That’s as far as I went. I would imagine someone who knew excel fairly well could use that to generate whatever they needed. if you cant support why are you creating one plugin in a day! Create one and do it right and give good support. no language support, no answers on forum, no future wp version support. Hey guys, don’t be hard with him. Some of yours comments show me that you dont understand that even if a dev release a plugin, it doesnt mean that he has a full time to work on it. I’ve made a lot of modifications to this plugin and i was going to releasr them but when i read the last comment by example, i dont want to. Now, you want a feature that isnt there? Ask gently and wait for it. You really need it? In a hurry? Pay for it. Im sure he will be please to work with you, or find a dev that has time (you have my website). Totally agree with Mat there; if you have issues with the plugin you either (a)try and fix it yourself (b) politely ask for assistance – remember it’s free assistance, so don’t behave as if you are entitled to it (c) stop using it and look for alternatives – nobody is forcing anyone to use this. Thanks for the support guys. I meant to update the plugins – but I’ve been so busy with my work and some other stuff that I did not find the time. But I will – someday soon. Plugin is working for me, but it’s not showing the radio buttons/check boxes on the home page. It only shows in the post. I did a little debugging and show_survey.php seems to be fine. Could WP be filtering this out somehow? Found the issue with the plugin. Turns out there was a conflict with another plugin called Advanced Excerpt. Thanks for a great plugin Binny V A! Appreciate all your hard work. I installed and created a survey fine, but after I put in [SURVEYS 1], publish, and view my live blog, the survey is not showing up. Can you please let me know why this is happening? A question thought: where can I modify the “Thank you” text after one has completed the survey? Its in the show_surveys.php file. Is it possible to provide the user with the results of the survey when they finish the survey? Are their any options to save the email name in a data base? Thanks so much for creating this plugin. It’s awesome and seems designed to do what I need. Just one question: On some questions I have an “other” response and then activate the text input field is available for survey takers to specify what they mean by “other”. But it appears that they must click the radio button next to the text input field in order for me to see what they input. Is there anyway to have the text in the text input field automatically collected with the results or have it automatically collect if the “other” radio button is selected? One more thing… the answer options are appearing out of order on my survey. For example the choices are 0-18, 18-32, 33-45. But instead it shows up to the user as 18-32, 0-18, 33-45. Any way around this problem? Thanks. How can I fix it so the visitors can see the results? Hi Binny, I came across your plugins: eventr and surveys. I will install and use over the weekend. Just wanted to say thanks. Also, I wanted to invite you to be a guest tech writer from time to time on perhaps answering questions and/or suggestions that you may have on your mind. Harlem Talk Radio is the site and we launched it May of 2009. Please have a look and let me know what you think. Hello again Binny. I try “Add New Answer” in localhost (EasyPHP) and not work, but I install plugin in my site and its works fine. Great plugin. 1. What types of question can I ask ? (I’m comparing your plugin with surveymonkey’s question types) I would very much prefer to use a plugin than survey monkey’s service so it would be good if you could do what they do ? 2. What formats can you output – eg .XLS ? 2. Plugin outputs CSV – it can be opened in Excel. Thanks a lot, great plugin and very well written/commented code. One question – If on submit, I wanted to make sure the user has answered all questions (entered answers/hecked checkboxes), which file should I edit to add the validation? survey _action.php?? ^^Hey Binny, I tracked it down to function e(..), which calls the function _e in wpframe. I don’t know where this goes though?